Killer Characters: Afternoon Tea for The Hound of the Baskervilles - and GIVEAWAY! Afternoon Tea for The Hound of the Baskervilles - and GIVEAWAY! Today's the big day. The afternoon tea fundraiser for the West London Theater Festival. All the stops have been pulled out: the event is going to be a full proper afternoon tea, outdoors at the oceanside estate of the Festival’s director Rebecca Stanton. Each ticket costs two hundred bucks, every table will have a festival actor or crew member sitting at it. Guests are invited to sip Prosecco and wander the lush grounds before sitting down to tea. Sounds perfect. The only thing not so-perfect, is that I won’t be sipping sparkling wine and Darjeeling with the guests but slaving in the kitchen and pouring tea. Mrs. Hudson’s Tea Room, of which I am part owner, is catering so they’ve put me to work. This year the centerpiece of the festival is a production of The Hound of the Baskervilles, which my business partner, Jayne Wilson, and I are hoping will be a huge boon to us. Not only theatre lovers but Sherlockians of all types will be flocking to West London to see the play, and where would the crowds go before or after the theatre but for afternoon tea at Mrs. Hudson’s and engage in a shopping frenzy at the Sherlock Holmes Bookshop and Emporium, located next door at 222 Baker Street. I must say, I don’t think the festival director has chosen her cast wisely, however. Surely Sir Nigel Bellingham, legend of stage and screen, is far too old to play The Great Detective. Not to mention far too much of a drunk. Let’s hope Sir Nigel rises to the occasion and doesn’t let us all down. As they say, the show much go on. Meanwhile, I’m trapped in the kitchen. And that is not my natural environment. This afternoon, we’d be serving smoked salmon and cream cheese on wheat bread cut into pinwheels, finger sandwiches of thinly sliced roast beef with locally made mustard and fresh arugula on light rye, cucumber with a touch of cream cheese on white bread triangles for the vegetarians, and egg salad, also on thinly sliced white bread. I liked making the sandwiches; it suited my orderly mind. I cleared everything off the back countertop and laid out the slices of bread in a long row. I went up and down the line following Jayne’s instructions: buttering the bread, laying on the filling, adding pretty herbs and fresh greens as required, putting the tops on, cutting them into the proper shapes with a careful eye for uniformity of size. Then I carefully placed the tiny, gorgeous sandwiches onto platters and covered them tightly in plastic wrap. Jocelyn ferried them to the fridge. “Yes, you. They need frosting.” One hundred and twenty-five tiny, perfect coconut cupcakes were cooling on a high shelf. The kitchen, as I have said, is small. We were running out of room to put all the food. “The frosting’s made. All you have to do is use an ice cream scoop as a measure. One scoop on each cupcake. Don’t worry about covering the tops to the edges. When that’s done, give the frosting a little swirl with a knife to make it look pretty and sprinkle coconut on top.” While she talked, Jayne mixed the dough for the next batch of scones. I set about icing coconut cupcakes in the same assembly-line fashion I had with the sandwiches. I studied the cupcake at hand. I hadn’t been trying to re-create the London office tower nicknamed the Gherkin in coconut icing, but it did bear a slight resemblance. Kelly, did you ever get an email from me asking for your PO box? You asked for a bookmark but the address was incomplete. I'm glad you contacted me here! Cannot wait for The Cat of the Baskervilles! We'll have copies for sale in Yon Bonnie Books in Inversgail. Good luck with the cupcakes and I hope the play is a huge success. Looking forward to reading this! Would love to win!!! I like the title and cover. Thanks for the opportunity. Drat! It's going to be a fun evening in Whitby. My daughter and I loved the first two books. She even did a book talk for school on ELEMENTARY, SHE READ! We are eagerly anticipating THE CAT OF THE BASKERVILLES! That's nice, Andrea. Good for your daughter. OOO this looks really good. I shall have to get it. Oh boy... theater and food...my two favorites. Thank you for the chance. I'd love to spend an afternoon there, too! Think the cover of "The Cat of the Baskervilles" is spot on. Love the colors and all the amazing detailing from the pipe in the title to the silhouette of Sherlock Holmes in the tea pot and cup. The cat's eye through the magnifying glass is too cute. Everything I have read about the book, including reviews, lets me know that this is a book I'd love to read. Enjoyed the small glimpse into the afternoon tea for The Hound of the Baskervilles. Thank you for the chance to win a copy of the book! I am looking forward to the next installment! I'd better start reading this series before I get to far behind. Thanks for the chance to win one of the books. I would love to win a book. I know with all the messages already on here I do not have a chance but I thought I would a least put my name. I love cats and I love mystery. Thanks for entering, Judy. Someone has to win! I would love very much to win this book. I love cats and I love mystery. I will try for a book. This series looks like fun. Thanks for the giveaway opportunity...love the title and connection to Sherlovk. Can’t wait to read this book. Sounds like an amazing event! Too bad you had to help in the kitchen, but you were still there to enjoy what you could. I would love to read this series! Thank you for the chance! Really enjoyed the synopsis of the book. Can't wait to read the next book in the series. Congratulations, Diane. You win! Please send me your postal address. Thanks for entering my contest. This sounds like a delightful read. 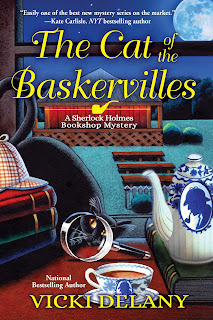 Love the Sherlock Holmes Bookshop mysteries! This book looks so good. Would love to read it. Such a fun series. I enjoyed the ones I’ve read so far. Would love to win an early copy! Lldawnjm (at) gmail (dot) com...thanks for writing and sharing your books. I love the takeoff on these titles and the covers...very charming. Please enter me.